The French and United States factories at Canton, c1841. ANMM Collection 00015750. Purchased with USA Bicentennial Gift funds. When I visit maritime museums, I am always drawn to the ‘China trade’ paintings of Canton (now Guangzhou), the southern Chinese port to which all foreign trade was restricted from 1757 under the Qing dynasty’s Canton System. 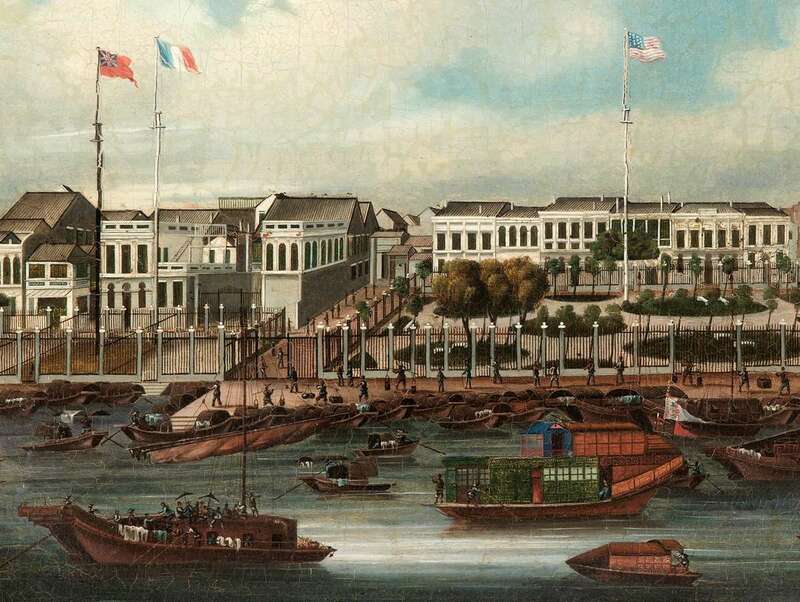 There is something about their composition that is so intriguing – the merging of Chinese and European artistic traditions, the bustling river crowded with boats, and the detailed architectural rendering of the Western merchants’ hongs (factories) with their national flags proudly displayed out front. Recently I have been researching one of the museum’s China trade paintings as part of a broader project on the 200th anniversary of the arrival of Cantonese settler Mak Sai Ying in Sydney in 1818. Our oil painting depicts the French and American hongs on the western side of the Thirteen Factories district along the Pearl River. It has been dated about 1841, or the latter stages of the First Opium War (1839–1842) between Britain and China, which would result in the abolition of the Canton System and the opening of five Chinese treaty ports to foreign trade. What I really wanted to know about our painting was: why would the British Red Ensign be flying in front of the Spanish factory? 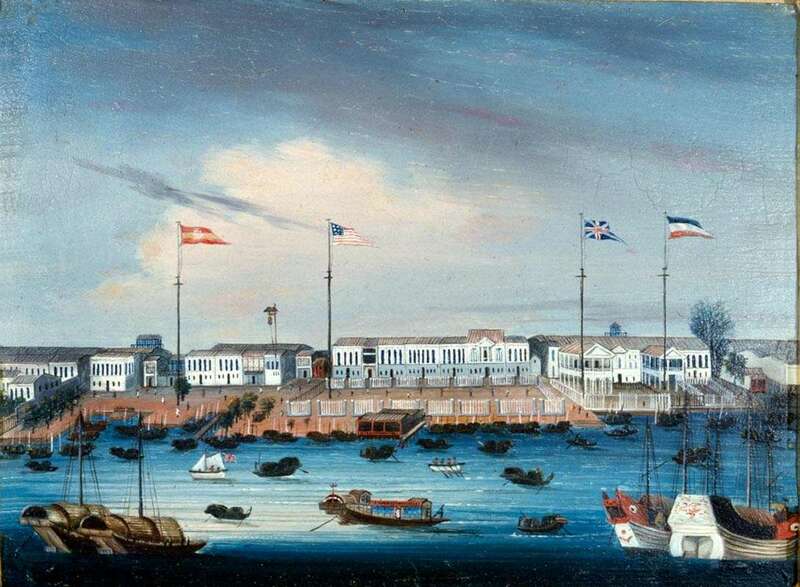 Hongs at Canton, showing Spanish, American, British and Dutch factories, c1810. Peabody Essex Museum PEMM20530. For a long time art historians dismissed the Canton factory paintings as generic works of art that were mass produced as souvenirs for foreign merchants. But recent research by Paul Van Dyke and Maria Kar-wing Mok, building on the scholarship of Carl Crossman and Patrick Conner, shows how unique these paintings really are. 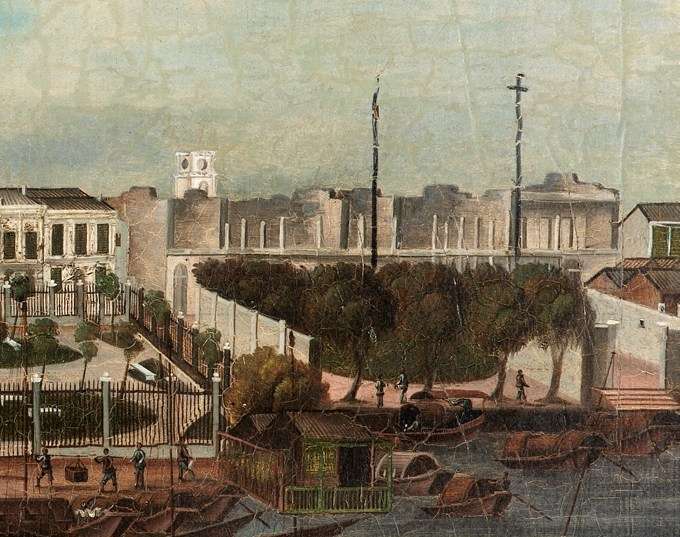 In Images of the Canton Factories 1760–1822: Reading History in Art (2015), Van Dyke and Mok have cross-referenced the scenes represented in export paintings with the archives of the European East India companies, to argue that they can be interpreted as reliable historical records. In some cases they have been able to use British, Dutch, Danish, French, Swedish and American records about foreign arrivals and departures in Canton to refine the date ranges of certain paintings down to a single year, month or even week! The Canton factory paintings became fashionable from the 1760s onwards, with Chinese artists usually employing a frontal vantage point that resulted in a flatter work with less sense of perspective, but a greater attention to detail. Contemporary works by European artists, on the other hand, tended to adopt Western aesthetic principles by using oblique views to achieve depth, but often at the expense of accuracy. The museum’s painting, created by an unknown Chinese artist, exhibits a conventional composition that provides a clear vista of all the factories lined along the Canton waterfront, with a lively parade of sampans and small watercraft in the foreground. 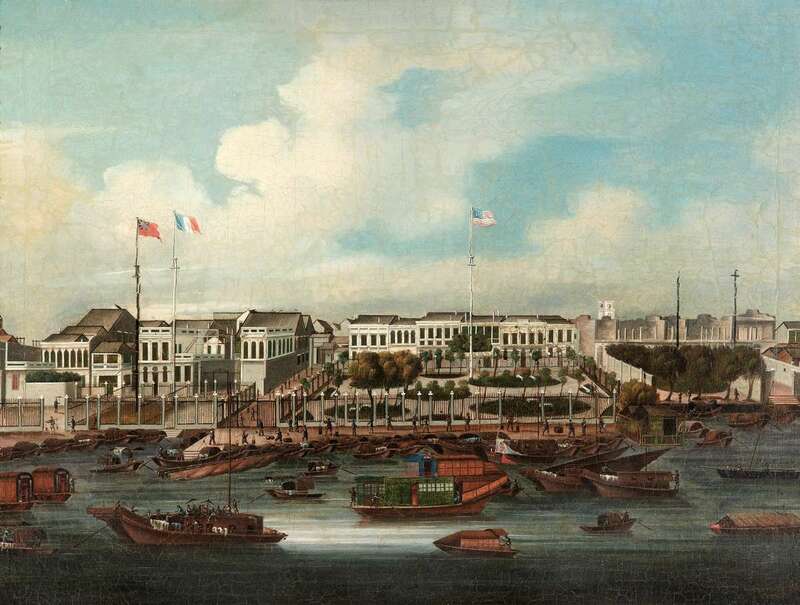 Detail of The French and United States factories at Canton, showing sampans, ferry boat, flower boat and China Street. ANMM Collection 00015750. Purchased with USA Bicentennial Gift funds. At the lower left of the canvas we see a crowded ferry boat that is being steered with oars, while in the centre foreground there is an elegant flower boat decorated with green trelliswork. Animated figures carrying yokes or going about their daily business are visible on the quayside and in China Street (the fenced passage to the left of the American factory), but the factory area itself shows few signs of activity. 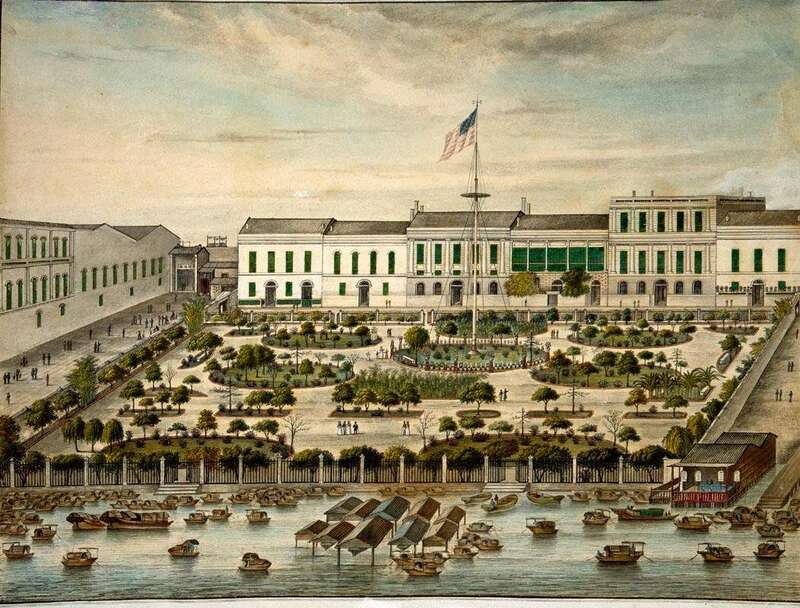 The American factory features a courtyard garden, originally laid out about 1840, boasting a number of flourishing circular beds (but they are not yet as developed as in the watercolour below from the Peabody Essex Museum, dated 1844–1845). American and French flags fly from tall flagstaffs, along with the British Red Ensign at the far left of the canvas. View of the American Garden, 1844–1845. Peabody Essex Museum E82881. Hoping that the presence of the British flag might help us to date the painting more precisely, I contacted Paul Van Dyke and Maria Mok for assistance. Maria was able to confirm that our painting documented a very specific period of time between two fires that occurred in 1842 and 1843. On the right side of our painting, marked by two empty flagstaffs, the artist portrays the ruins of the once-grand British, Dutch and Creek factories that burnt down in a fire on 7 December 1842 (Chinese Repository vol 11, 1842, p687). The remnants of the white clock tower that stood in the courtyard of the British factory are discernible, as is the adjacent Hog Lane, where foreign sailors would head for entertainment and souvenirs. Detail of The French and United States factories at Canton, showing Hog Lane and ruins of the British factory. ANMM Collection 00015750. Purchased with USA Bicentennial Gift funds. With the loss of the British factory, the British consulate was temporarily settled in the building once occupied by the Spanish on the western side of the Thirteen Factories, identified in our painting by the Red Ensign. On 24 October 1843, another fire destroyed the Danish, Spanish and French factories (Chinese Repository vol 12, 1843, p560). This means that the date of our painting can now be narrowed down to a 10-month window between December 1842 and October 1843. A wonderful illustration, in the words of Mok and Van Dyke, of history in art. With thanks to Maria Mok (Hong Kong Museum of Art), Paul Van Dyke (Sun Yat-Sen University) and Karina Corrigan (Peabody Essex Museum) for their assistance.